Last Saturday I was very busy. 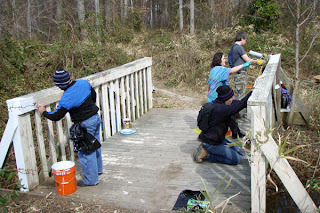 I spent all of the morning and part of the afternoon participating beach cleanup event at the Back Bay National Wildlife Refuge. Organized as part of both National Public Lands Day and the Ocean Conservancy's 2011 International Coastal Cleanup, I went out with a group of volunteers - including families from the company Booz Allen Hamilton, some scouts, regular volunteers and staff from Back Bay - to pick up trash along the beach. We covered one mile of beach and collected a pickup truck full of trash. The greatest quantity of items were plastic bottles, plastic bottle caps, plastic bags, food wrappers, and unidentifiable pieces of plastic and styrofoam. One of the kids asked why folks would throw all this garbage on beach. I explained that most of this garbage was not discarded on the beach but was washed onto the shore from the ocean. 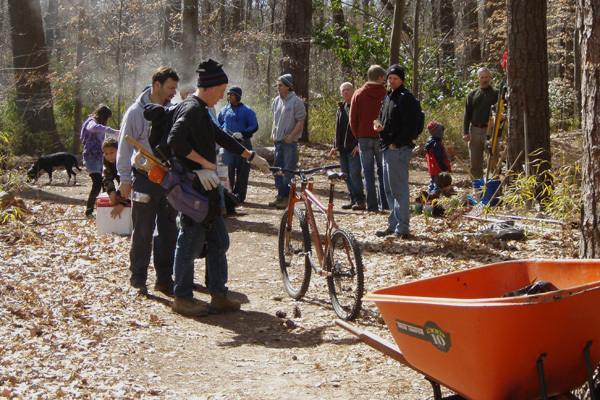 Most of it started as litter in city and suburban streets, malls, and shopping centers. Tossed by careless people, falling out of overfilled trash cans, flying out of the back of trucks, being blown out of landfills, the trash get washed into the storm sewers by the rain and flows right into our rivers. First this trash clogs the river shorelines but slowly much of its is washed downstream into the Bay and then into the Atlantic Ocean. Some of the garbage gets washed back on our beaches, but much more gets pulled by wind and currents out to sea. Out in the middle of both the Atlantic and the Pacific, there are great oceanic garbage patches littered with floating plastic debris from our modern world. Caught in the center of the great ocean gyres - the centers of rotation of the major ocean currents - the trash floats endlessly because these plastics don't degrade for thousands of years. If anything, the plastic just breaks down into smaller and smaller pieces of plastic. This debris ranges from recognizable items like bags, bottles and caps down to microscopic bits. The plastic is too often mistaken by sea life for food. Sea birds eat bottle caps and old lighters. Turtle think plastic bags and balloons are jellyfish. Plankton eating fish sweep up the microscopic bits of plastic. Of course none of this plastic is edible and much of it gets stuck in the animals digestive track. Dead sea creatures - turtles, sea birds, even whales - have been found with their stomachs filled with plastic trash, likely contributing to their deaths through starvation. One well documented example of plastic impact on sea life looks at the albatross colony on Midway Island in the middle of the Pacific, which is about as far way from civilization as you can get - http://naturefinder.blogspot.com/2009/03/midway-atoll-national-wildlife-refuge.html. The plastic may even be working its way into the human food chain as smaller fish eat the microscopic plastic bits, the bigger fish eat the smaller fish, and we catch and eat the bigger fish. What can we do about all this? Well, first of all make sure you don't litter and that all your trash is securely disposed of in trash containers so it doesn't escape. 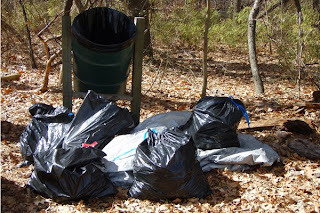 If you do see litter, help to pick it up. 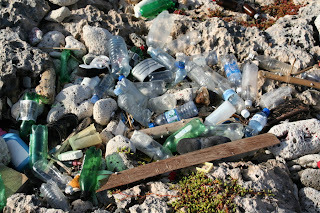 Of course, recycle the plastics when you can - although this is not as simple as it sounds since most plastic is not easily recyclable and most recyclers only take plastics labeled Type 1 and Type 2. 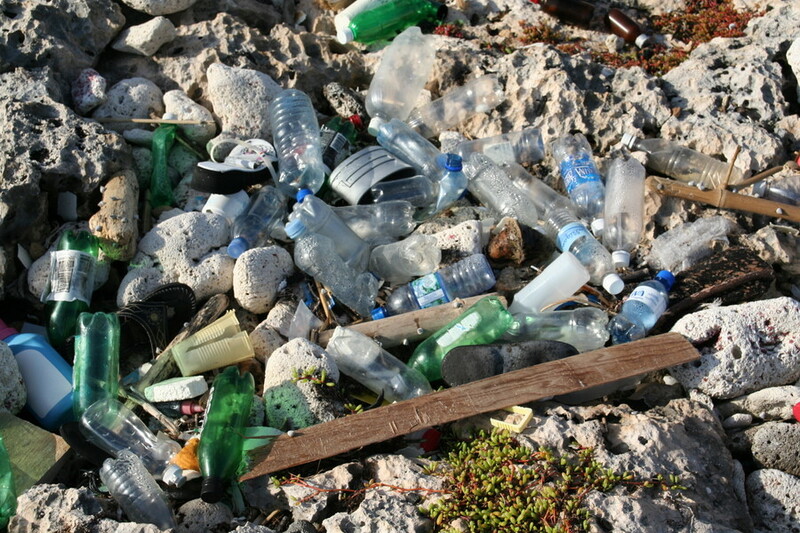 Ultimately, the best solution is to reduce the amount of plastics used for packaging. Because they are versatile, light weight, and relatively cheap, plastic packaging has become pervasive in our society and reversing this trend will require that we make some serious choices. What is an estuary and why would someone declare a national day for them? And how do you remember to spell estuary? 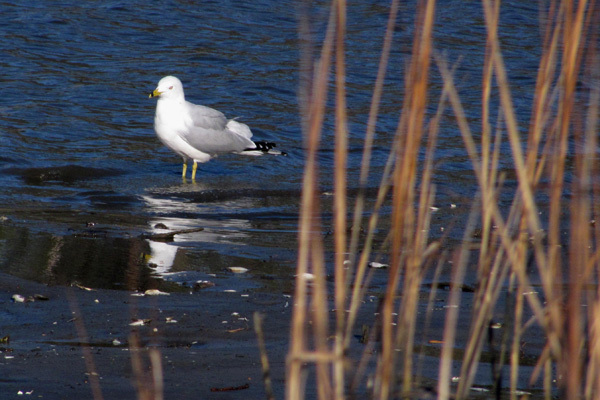 Well, an estuary is the extremely important ecosystem where fresh water from rivers meets the salty water of the sea. 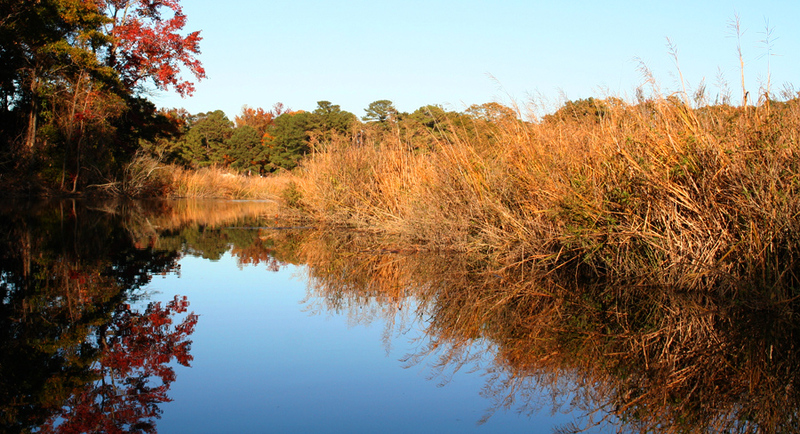 The Chesapeake Bay in its entirety is one of the largest estuaries in the world. 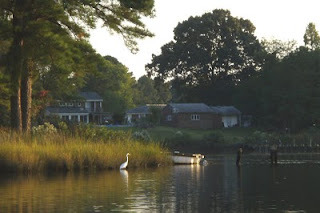 Our little Indian River is an estuary in its own right. Fresh water from rivers, like the little - and today rain swollen - creek in our Indian River Park, flows into the vast tidal expanses of the bay. 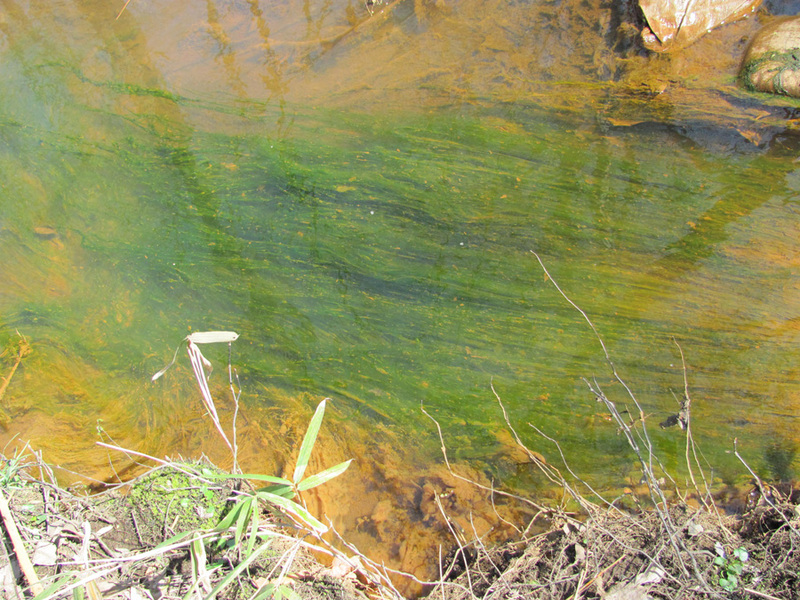 The mixed water is brackish - slight salty - supporting a unique mix of animals and vegetation. These shallow tidal waters can support lush marshes, which in turn provide nurseries for a wide variety of fish and shellfish. 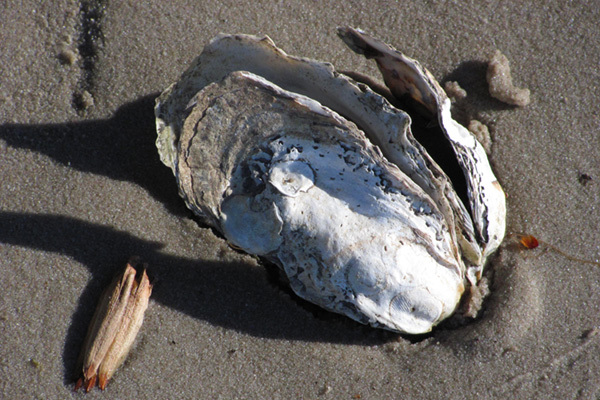 While some shellfish, like oysters and clams, stay put, the fish and certain shellfish like blue crabs migrate into deeper water as they grow. The plants of the marsh also provide critical food for migrating birds including ducks, geese, redwing blackbirds, and rails. The estuarine marshes also act as important sponges, slowing down flood waters - both those coming downstream from heavy rains and those being pushed upland from high winds. The marshes filter out sediment and absorb excess nutrients. 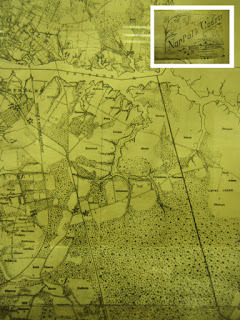 Our little Indian River estuary lies amid a long established suburb. 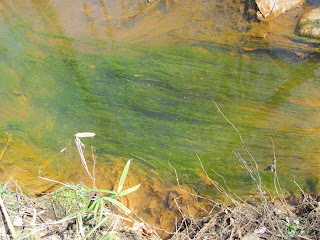 The waters are laden with too many fertilizers and too much bacteria, due to rain runoff from our streets and yards. Too often we've built rigid bulkheads obstructing the marshes. Yet, even in the Indian River acres of marshland still strive to provide their ecosystem services. Ducks and redwings stopover on migration. 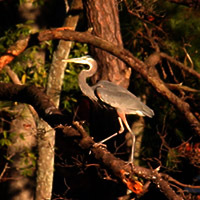 There are fish to be caught by patrolling osprey, egrets, eagles, and the intrepid fisherman. 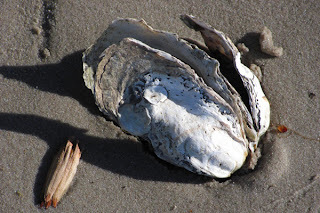 You can even find the occasional oysters, although not anywhere in their historical numbers back when Indian River Road was called the Princess Anne Shell Road. The waterside provides scenic beauty and enhances property values. So, we celebrate National Estuaries Day to give thanks for the bounty provided by these precious waters and to remind us to take care of them so that will get better and be there for us tomorrow. Was your house buzzed by a low flying aircraft last night? 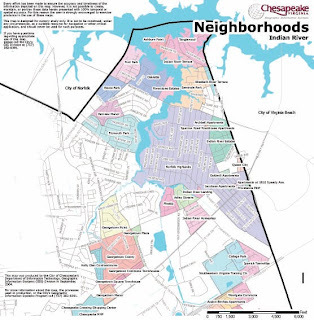 That was most likely part of the City of Chesapeake's emergency mosquito spraying program. 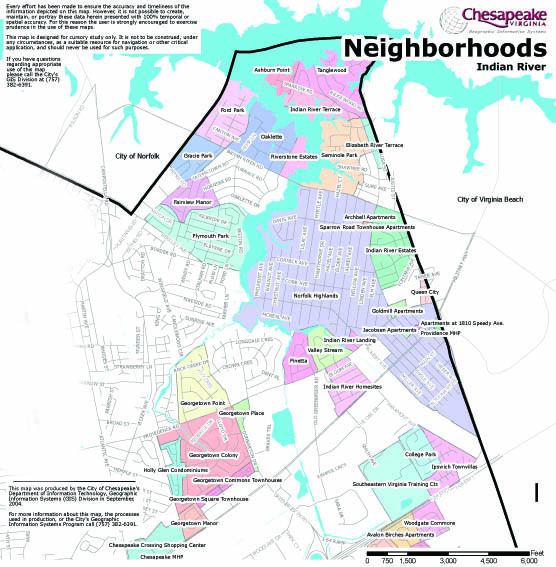 Weather permitting, the entire city is being sprayed Monday and Tuesday nights to combat the increase in mosquitoes following Hurricane Irene. This emergency spraying is not without controversy. While the insecticide in the concentrations used is not likely to be directly harmful to humans, mammals, or birds, it does kill other insects beyond just mosquitos. Other beneficial insects such as dragonflies, butterflies, and bees can all be killed by the misting. The spraying is done at night to try to minimize the impact to these other insects but even the city website warns that beekeepers may 'wish to take the extra precaution of covering their hives for protection'. Ultimately, the aerial spraying has limited effectiveness. While mosquitos that come in contact with the insecticide will die quickly, the aerial spraying does little to control the next generation of larvae waiting to grow into adults and the mosquito population rebounds fairly quickly. Residents can help control mosquito population by eliminating standing pools of water where mosquitoes breed. Friday morning I donned a pair of rubber boots and headed for Indian River Park. Parking by the Youth Center on Rokeby and Providence, I walked over to the culvert where the Indian River flows under Providence Road. On the north side of the road, the river turns tidal and slowly broadens into a wide estuary. But on the south side it is a small stream draining the surrounding suburban neighborhoods, sheltered by Indian River Park. My goal today was to hike up along the river to I-64, just short of its source which is on the farside of the that superhighway. My first steps on this ‘creeking’ expedition where not encouraging. The water was only about 6” deep but as I stepped into the stream my foot sank into a bottom deep with sediment. Extracting myself, I bushwhacked a few yards upstream and, fortunately, the streambed turned sandy and firmer. Overall the stream was fairly well connected with its flood plain. There was no deeply eroded channel, just a broad bowl through which the little river flowed. This was a good sign as the river could expand easily during storms, slowing the water flow and reducing the sediment and fertilizer load dumped into the tidal estuary, and ultimately the bay. The park at this point is only a city block wide, the woods flanking the river a typical second growth forest with a mix of trees perhaps 50 years old. A stand of phragmites stood on the right bank as I started upstream. Alternating between the stream bank and streambed as conditions allowed, I took an unscientific inventory of the flora and fauna as I went. Birdsong filled the surrounding trees. At one point I stopped to listen to a pair of Blue Jays call to each other from opposite river banks – “too-oot, too-oot.” About 200 yards upstream I came across some subaquatic vegetation in the river, long grasses pulled horizontal in the shallow current, probably sago or horned pondweed. 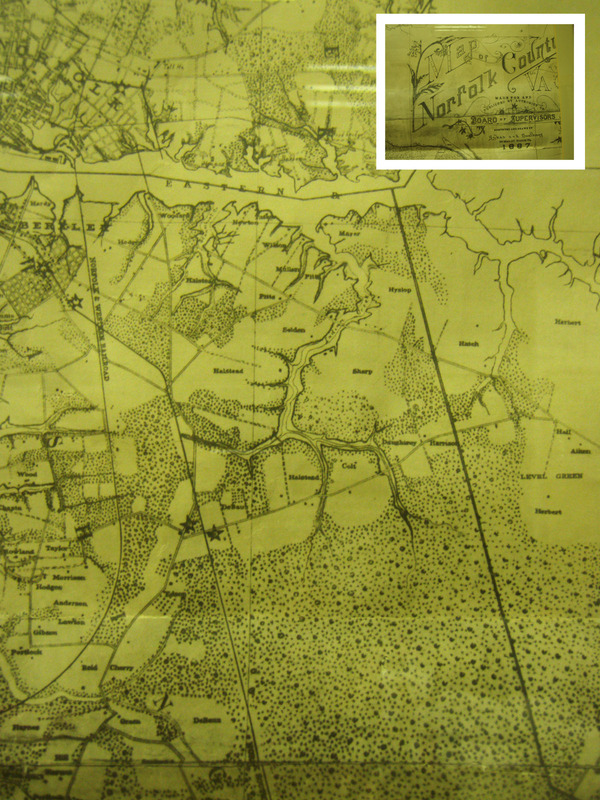 A few hundred yards further, as I neared Military Highway – the aging primary road that 60 years ago was the area's original ‘beltway’ – the channel narrowed and deepened. (What I originally thought was Japanese Stilt Grass but now identify as) native bamboo Arundinaria filled both banks and English Ivy was visible on some of the trees. As I continued upriver, alternating between banks to find the clearest path, three mallards hurried away ahead of me. After a few minutes I emerged from the thicket onto Military Highway. Just before the roadway was a deep pool clogged with debris, both natural and man-made trash. 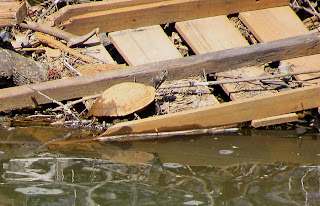 But even here nature sought a foothold and three turtles basking on the debris pile. Their carapaces were brown with mud but I think they were Red-bellied Turtles. Continuing on the south side of Military Highway, the stream again broadened and shallowed. The park gets a bit wider and more diverse. Within the river were significant stretches of subaquatic grasses. Whenever an eddy in the stream provided an area of calm, I could find a school of 20 to 30 minnows – inch long fish. I startled numerous frogs along my trek. 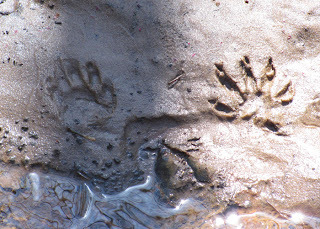 Raccoon tracks covered the stream banks. 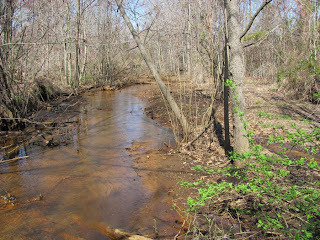 The stream was still connected to its flood plain and the stream often broadened into multiple rivulets, swamping some areas. 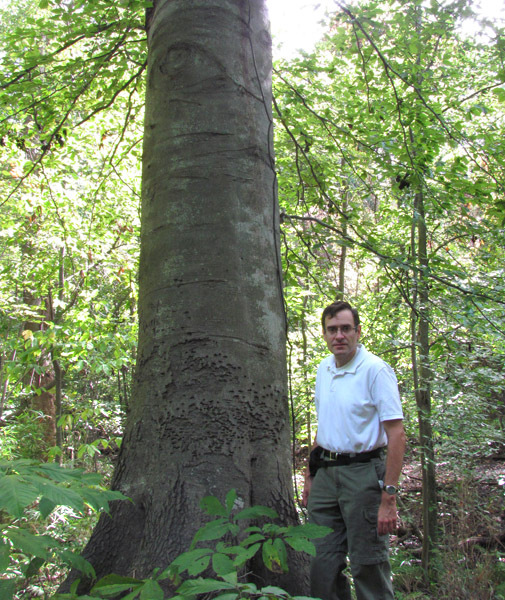 About three hundred yards along was a stand of grand old trees with trunks 4 to 6 feet in diameter, including several oaks and what I believe is a huge beech. Cardinals, Thrushes, and Grackles moved through the tree line. As I approached the power line transmission corridor midway through the park, the Arundinaria bamboo became so thick I had to hike away from the river to find one of the park trails. In this area there were also several pockets of English Ivy, another invasive, growing up trees. Beyond the power lines the stream’s character changed again. The stream took on a more ‘engineered’ look, straighter and with higher banks, probably altered decades ago to speed the water drainage from the surrounding developments. In the shallow stream there were still lots of invertebrates – water striders – but almost no fish. 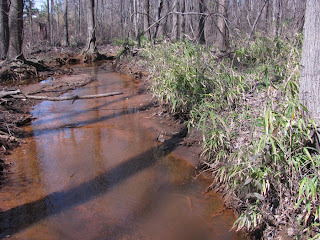 The stream bottom varied between firm sand and quicksand silt. I stepped into one of these quicksand traps and quickly got a boot full of water. The only major fauna I stumbled upon, actually almost stepped upon, was a large snapping turtle in the stream. 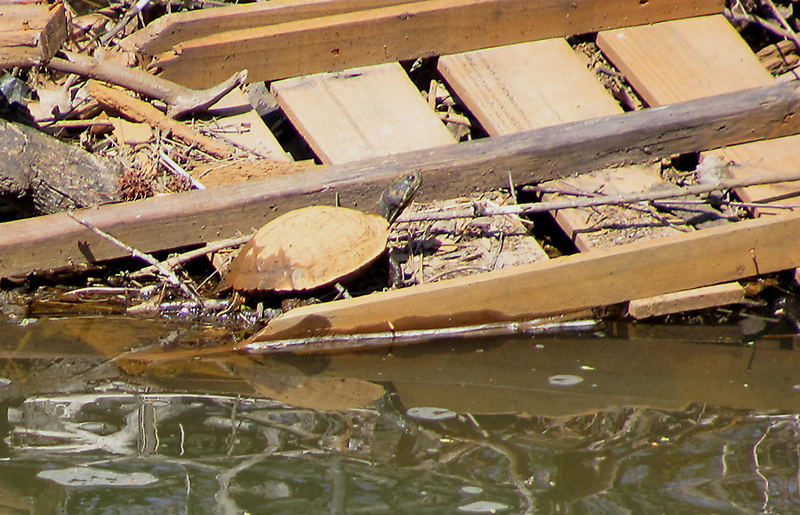 I’m not sure who was more startled but the turtle quickly moved into a deep pool beneath a log. As it went I could clearly see its leathery tail and sharp claws; not a character to mess with. In the final stretch up to I-64 the stream dwindled and the river bottom was filled with leaves. 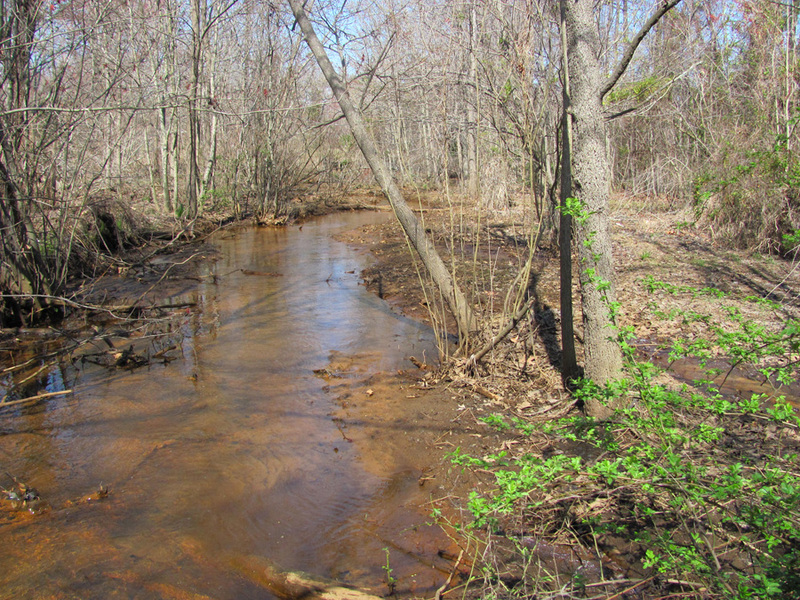 The stream disappeared under a dark and rock blocked culvert below the I-64 highway. 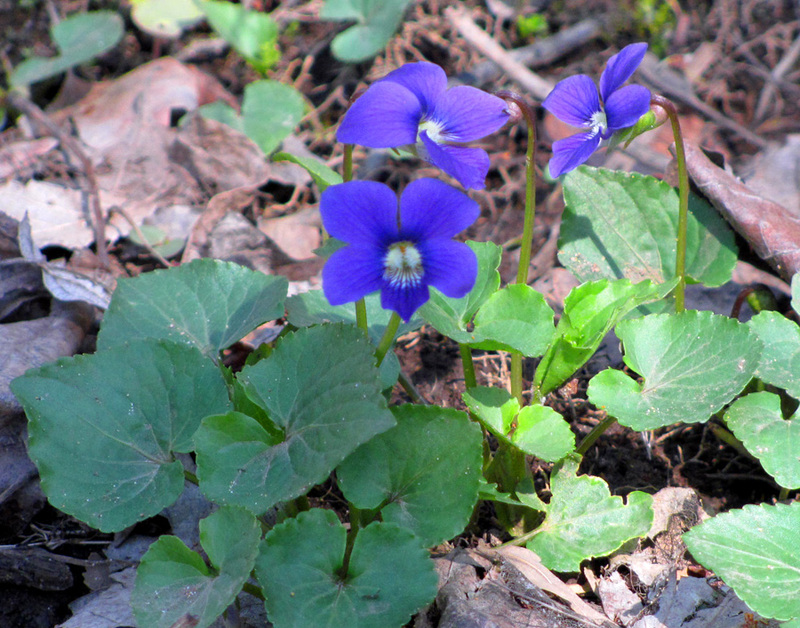 Overall the hike up the river revealed a mixed bag. Surrounded by a long developed suburb where almost 50% of the land was covered pavement or rooftops, the park is not a pristine wilderness. 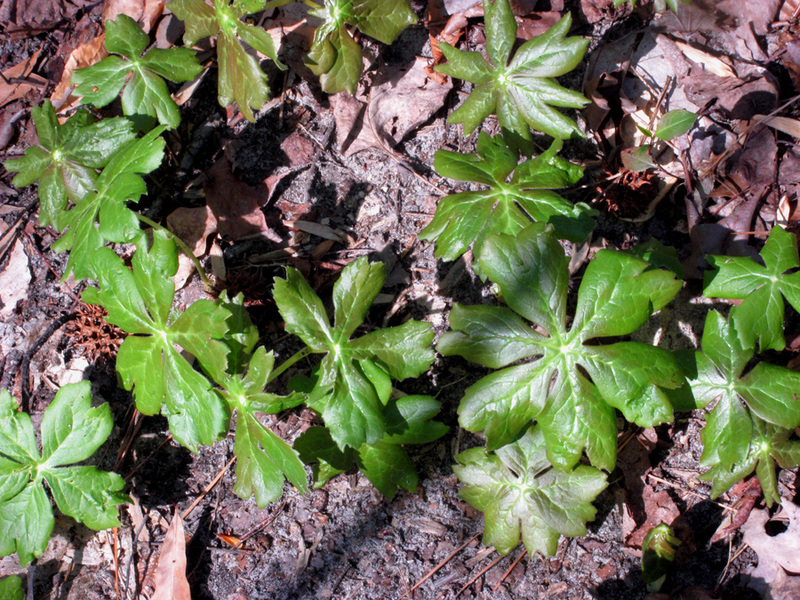 At places invasive English Ivy is making deep encroachment, but much of the park still is filled with native nature. The river is home to fish, frogs, turtles. 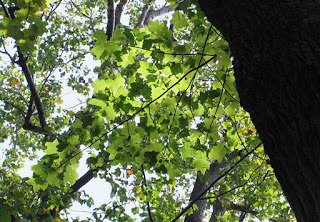 Birds sing in the canopy and raccoons - and most likely foxes - hunt in these woods. Native plants - including wildflowers like blue violets and mayapples - pushed up where the invaders were not dominant. And hundred year old giants tower above it all. Definitely a landscape that is worth enjoying and worth saving.